TPC Professional Edition and TPC Premium Edition now import/export Google Earth KML files. Because it makes your surveys easier to share. When we introduced background (raster) images in 2004 they caught on right away. Suddenly, clients could see our surveys superimposed right over an image of their property. With such a great visual reference, the survey made sense. They could see the encroachments and easements that were so hard for them to visualize before. Well Google Earth the next great visualization tool. Someone said, “It’s like playing with fire, but safer”. You are already familiar with exporting a drawing as a PDF, DWG, DGN, PNG, etc.. Well now you can add KML to the list. 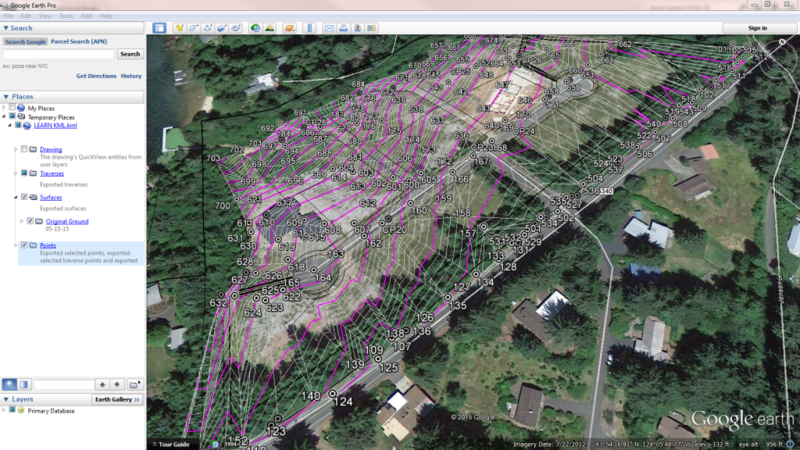 Just export all or part of your survey to a KML file then import that file into Google Earth and there’s your survey. When you export a KML file from the TPC Desktop, you can export the entire survey or any part of it. Want just the boundary you surveyed and the adjacent properties? Just select those traverses and export them. What just the location of the sprinkler heads of an irrigation system, just select those points from the Point Manager and export them. It’s pretty easy to get just what you want. When you export a TPC drawing to KML, you get everything in the drawing that can be converted to KML. So if you manually drew in a feature it shows up in Google Earth along with your survey features. If you can get a KML file from somewhere else, chances are you can import it into TPC. TPC uses a standard folder structure when it exports to KML. You get KML folders for drawings, traverses, surfaces and points. So when you import these KML back into Traverse PC, you get drawings, traverses, surfaces and points. It’s pretty cool to see how it works. TPC now stores multiple backup files (up to 10) for your surveys. 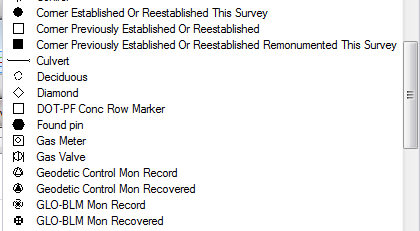 TPC creates backup survey files with the extension TRB1 through TRB10 (depending on the Number of backups you allow). If you load an existing TRV file, and make changes to it, and press save, a backup file is created / updated from the original TRV file. 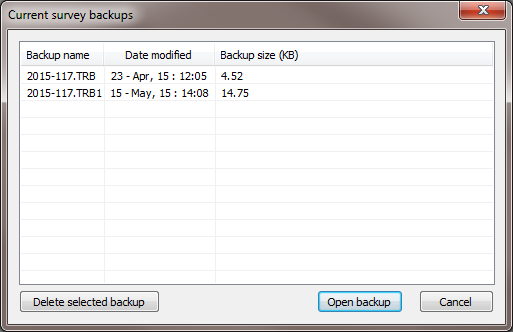 You can select any of the backup files and load them from our new dialog. The backup listing are sorted by Date modified. The bottom most survey backup listing is the most recent. Now you can select more font sizes from the Drawing View’s Format Bar. We added a few more line widths to the Drawing View. Now you can choose 0.00 to 0.12 in 0.01 increments. Thanks to some of our BLM users, we included a number of new point symbols for monuments you set and tie. Some of the new symbols included are primary mon record, primary mon recovered, glo-blm mon record and glo-blm mon recovered. We added about a dozen new line types. 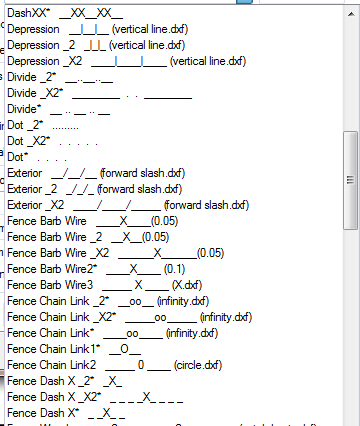 You’ll find new line types like Barb Wire, Tree Line Double, Depression and Interior. You can now specify a font style like Bold and Italics for lot labels. You can also tell TPC to draw just the outline of the lot label, like we often do for adjacent lots. Now any closed loop traverse can have automatic lot setbacks. Prior to this change, only parcel traverses in the Parcels or Lots traverse group got automatic setbacks. 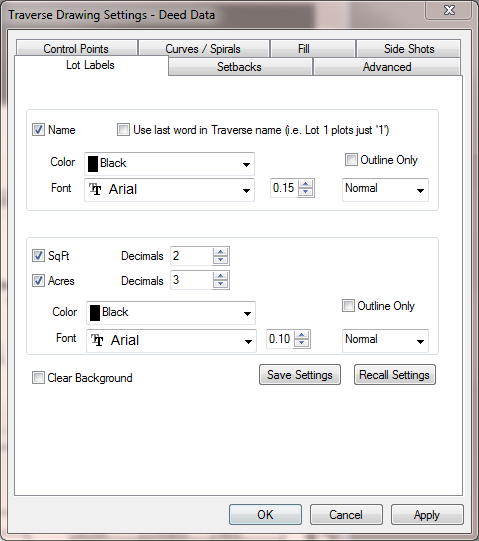 When you double click a drawing object for a traverse (line label, point symbol, lot label, automatic setback line, etc) the Traverse Drawing Settings dialog opens the corresponding tab. So if you click a side shot line, symbol, line label or point label, you get the Sideshots tab. If you click a lot label or lot area label, you get the Lot Labels tab. And the same goes for control points and automatic setbacks. You can now include elevation offsets to your horizontal offsets. So the 20′ ROW can also be 0.5′ lower or higher. And multiple offsets do multiple elevation offsets. You get the latest release of the CAD drivers from Open Design Alliance. They are continualy improving compatiblity and fixing bugs.